I am not always so great about resolving tough dilemmas. Unfortunately, I seem prone to having them lately. My latest little issue is spinning related. 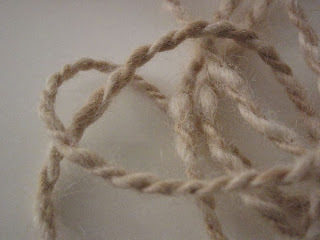 I came up with a super cool idea for using my older, less experienced handspun yarn. (How often do you get that combination in the same sentence.) The idea is fantastic if I do say so myself. It combines a myriad of arts and solves a problem all at once. Seriously, don't make me do a list. Well, in solving a problem, I have created another problem for myself. I ran out of yarn. I knew I didn't have much, but I guess I imagined my project much smaller then it is. Or perhaps I imagined the yarn as much more than it was. I mean, this is two year old, first or second time plying yarn. So now I need a solution. So far the only one I have come up with is to spin some more of the fibers that I made the first yarn with. (Lucky that it was one of my forays into buying, washing and spinning your own alpaca fibers.) The real problem with this is I can't spin thick enough. But wait! This is a two ply yarn, just spin and then ply it. NO. No good. While I can increase the width of my single enough to make a similar sized two ply, the single is also FAR to consistent. Well, now I am thinking that I should 3 ply it. But that really wouldn't solve anything would it? This all leaves me terrified that I will spin the remaining however many ounces of fiber that I have, ply it into a two spun and begin knitting it onto the started project..... only to find out that the difference is notable. My soul salvation is that I plan to felt the finished project and think that maybe.... just maybe the felting will cover up any minute differences. Here are a couple of pictures to give you an idea of the trouble. 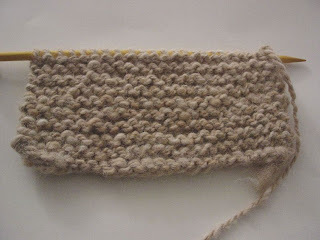 (This is near the end of the yarn so its more even and consistent then the front. The thickness is probably best noted on that right hand corner. I'm also a little afraid that I will lose a portion of the yarn in plying. 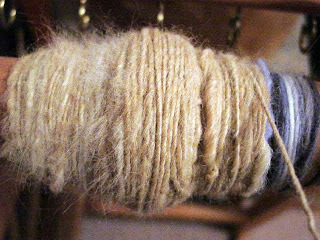 It had been a while since I spun this fiber (from the lock) and the first portion is fuzzier and a bit looser. If any spinners or felters out there have any advice, I would greatly appreciate it.